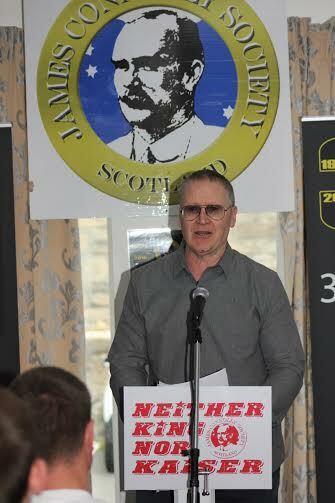 Last month Gary O’Shea, a founding member of Anti-Fascist Action, delivered the keynote address at Connolly Conference 2015 in Edinburgh. Introducing the speech Gary said ‘Liberal piety surrounding immigration must first be rejected in order to allow the working class movement to develop it’s own analysis’. We are delighted to publish, for the first time, the whole conference address. Gary O’Shea, founding member of Anti-Fascist Action, addressing Connolly Conference 2015. In 1962 Joe Valachi a soldier in the Cosa Nostra was arrested and turned informer. He explained how the organisation was structured, fingered the top men and generally blew the gaff. It was the beginning of the end for the Italian Mafia’s stranglehold on organised crime in America. One man was capable of wreaking such devastation not because he was high-ranking or particularly bright, but because he was an insider. And he broke the code. And he was the first to do so. David Goodhart is of a different hue, but an insider nonetheless. A liberal academic of impeccable lineage: he founded Prospect magazine, and chaired the think tank Demos. Then he stumbled across an article by Tory Minister David Willetts which argued that mass immigration must eventually undermine the contributory principle of the welfare state. And it got him thinking. Eventually he went public with a 6000 word essay entitled: ‘Too diverse?’ A book, ‘The British Dream: Successes and Failures of post war immigration’, followed. Although widely reviewed, as far as his erstwhile liberal colleagues were concerned, he had breached the code, and in the vernacular ‘ratted them out’. And as with Joe Valachi they hated him for it. He has since been compared to Enoch Powell, accused of being a neo-fascist, and banned from the Hay literary festival. Now, liberals generally support the right causes, just not always for the right reasons. So their sense of dismay is not just because of Goodhart’s apostate views on uncontrolled immigration and its consequences for social democracy, but also, and as importantly, what he might reveal about them and their motivations; mainly their fear of being found out. As a fellow traveller on the journey after all, he could hardly be better positioned to nail the trademark middle class fallings, (snooty, superficial, self-aggrandising,) which made an ersatz endgame more or less inevitable. Wholly lacking in appetite or desire to provide a meaningful challenge to the social and political hierarchy on which they are part, the smug irrational belief in the innate superiority of their own nation has been replaced by the smug and irrational belief in the innate superiority of their own class. And from their vantage point it is all too easy to see why working class communities, especially when allotted the prefix white (by them incidentally) are cast as illiberal, reactionary and even primitive. As a consequence of a near unanimity among the liberal intelligentsia in academia and the arts, this global citizen ideology has permeated the media and to varying degrees all the mainstream political parties as well. It might have been expected that the groups from the communist, socialist and anarchist traditions, otherwise soaked in their respective dogmas, would to some degree hold the line, but in actuality were among the first to be engulfed. Which helps explain, why left-wing liberal and indeed neo-liberal arguments extolling the virtues of mass immigration appear to be near identical. In the real world this uniform emoting is not cost free. On the contrary, the political price is a heavy one. ‘They are coming here for a better life’ they hector at every opportunity, while displaying a casual disregard for how that might sound to the people struggling for a better life who are here already. The people ‘here already’ it should be noted, include previous immigrant communities. Not that the ‘hypocrisy begins at home’ brigade care, but for the reluctant hosts it can all be expressed in one word ‘competition’. Ever greater competition for housing, schooling, health care, wages, along with the all- important, though never flagged, societal esteem; a sense that wider society holds them with something approaching affection or consideration. Ironically all such one-sidedness achieves is to harden suspicion that the chief beneficiary of immigration is the immigrants themselves. And for any liberal lefty worth his salt this is exactly how it should be. From those forced into a contest- not of their making – the moral argument carries little weight when they perceive those ‘demanding a better life’ are likely to be doing so directly at their or their family’s expense. Whereas politicians are denounced for making the less well-off pay the price for the banking crisis the liberal left are insouciant about the exact same sector of society visibly carrying the entire burden when the crisis involves refugees or simply immigration. Needless to say such studied indifference effectively destroys the credibility of any Left electoral initiative from the outset (as Jeremy and chums will find out soon enough). On a more serious level, far from fighting prejudice, and reinforcing a sense of common humanity, it more or less insists on a communal tribal and atavistic response, which liberals regard as a vindication of their initial stance: ‘See we told you so’. Clearly, when all jaundiced prejudice from whatever quarter is set to the side, it is perfectly clear that immigrants and refugees, by definition a random selection of society are kind and cruel, lazy and diligent, generous and avaricious, easy going and humble, when weak, assertive and even violent when strong. Immigrants, are in short, as bad as the rest us. Although predictably sketchy on precisely how, the Left continues to maintain this unprecedented transfer of population is there to “fortify” the indigenous working class. In that case the CBI, and the Institute of Directors, immigration’s most ardent public backers must be an especially enlightened bunch. Tellingly across the Channel influential French think tank Terra Nova, (advisor to President Hollande in 2012) sees no need for such mendacity. With, in the circumstances, admirable candour it declares “the working class is no longer at the heart of the left wing vote.” Instead the political future will be “younger, diverse and more feminised.” As they see it, the task for the Left is not to amalgamate the existing minorities or new arrivals with their previous base. No. Far from creating a new constituency from the existing parts of the working class, the more or less stated aim, with a hat tip to Berthold Brecht here, is to import another instead. It follows that for this box fresh constituency to take root, the previous one must first be disabled, invalidated and rendered ‘hors de combat’/out of the fight. Provoked, the prestigious social democratic Jean Jaures Foundation recently responded with a withering state-of-the-nation response, which ripped like grape-shot through the left wing salons. Aiding and abetting the Front National, not resisting, was the damning message. “The Left is trying to make up to what it classes real minorities who it believes are discriminated against. In doing so it has become indifferent, even scornful of the wider French working class. They say to these native French ‘you have not understood, you are racist and sexist, and so these people have said, so be it.” And so they vote Front National. It is indeed a shrinking world. This is undeniable. Consequently a holistic view is now an imperative. As we have seen ‘immigrationists’ insist on the free movement of labour and juxtapose it with the free movement of capital. Yet, the free movement of labour comes in the wake of the free movement of capital – the former for the most part at the behest of the latter. So while the ‘open borderers’ might like to wrap themselves in the Red Flag while humming the’ Internationale’ all they are really saying is allow the market to find the correct level: ‘let the market decide’. In previous generations when immigration came primarily from the West Indies and the Indian sub-continent it was almost exclusively through the Labour Movement that the new arrivals were politically integrated, and as a direct result, to the chagrin of the Right, class as much as race became their anchor of identity. Today such a facility, in any meaningful way, no longer exists. Nevertheless as ‘immigrationism’ has it, without for example the NHS being constantly being replenished from abroad it would collapse. But what happens to those far poorer countries that are deprived of the skilled labour they have invested in? For the immigrationist any such concerns are always trumped by their ‘right to a better life’. Medical skills are transferable, so if they want to cross borders to a richer country where they can improve their earning capacity that is their right – even their duty. And their duty to the country that trained them? Or to the people/patients they have left behind? They have little to say about any of it for a very good reason. For them the individual has primacy over society, both in regard to the one he has left and in regard to the one he intends to join. Again, none of it has any bearing on internationalism of Marx and Engels. It is instead the internationalism championed by Friedman and Hayek. Or to put it another way, if international solidarity is to have real meaning it must be about benefitting peoples as a whole, rather than as now, encouraging, indeed insisting, the better heeled or better equipped decamp. Once again a reminder; the ‘global citizens’ liberals are most interested in, are the ones they imagine (“among the migrants were poets, writers and lawyers” – Christina Lamb, Sunday Times magazine) who most closely resemble themselves. Somewhere along the way, they have managed to turn the cry ‘bring me your poor and huddled masses’ on its head. Wisdom has it that Jeremy Corbyn will never be PM. And as a consequence Labour will not be in government for the foreseeable future. What critics ignore is that none of his rivals would ever have formed a government either. Not because they are politically timorous, which they are, but because the gulf between Labour’s previous working class constituency and its contemporary base of support is now gargantuan. How can this be, when the commonly held view is that New Labour has been rejected decisively in favour of a return to the politics of the 80’s and Old Labour? Well, Labour may have indeed retreated from neo-liberalism, only to fall into the clutches of it’s sometimes ally, social liberalism, instead. A coalition limited to pulling together the public sector, union activists, and members of the metropolitan middle class, youthful idealist and ethnic minorities will not and cannot ever seriously engage, with the concerns of the working class proper. Liberalism’s in-built antipathies will see to that, and so it will never succeed. What it can do, indeed the only plausible route for Labour into government is alongside the SNP, Lib Dems and Greens. That is achievable. But once again the working class will be as firmly shut out, as shoved to the margins, as it was under Thatcher and Blair. And while it is true that UKIP supporters appear broadly approving of Corbyn’s politics on issues such as the NHS, housing, and the railways, any approving nods and winks will absolutely evaporate once the small print regarding his policy on immigration is foregrounded either by himself or his opponents. At the recent Labour conference the only thing the Labour leader said on the topic was: “In the past there was mass emigration from Britain, now there is some immigration to Britain.” His message to working class communities most directly affected: ‘Get over it’. Of course he wasn’t talking to them, but to, and for his supporters, so presumably saw no reason to mask his disdain. But it’s all too easy to imagine social democrats on the continent, fully aware of the price paid for such dismissive body language (the employment of ‘some’ for example), shaking their heads in despair. A more public rebuke on similar lines when it matters and the options for many a concerned British voter will be rather limited: a) not vote, or b) like their French counterparts say ‘so be it’ and turn in ever greater anger and numbers to UKIP (who in opportunist fashion will adjust policy to suit) or whatever succeeds it. For Labour the choice is as follows. Take a step towards the working class and narrow the gap, or step the other way and let UKIP, (with bone fide fascists in tow) pour into the breach. Say no to the scenario in France and reverse away from it. Alternatively, demand mass immigration is “celebrated” and accelerate toward it instead. Overwhelmingly liberals will give their backing to the second option. A matter of principle they will say. It might meet with the dictionary definition alright. Yet no matter how you cut it there can be no disguising what we are dealing with here is an elite hand-me-down doctrine. At face value it might sound even noble. But people shouldn’t be taken in. Open borders and the free movement of capital, global citizenship and the free market all chime for very good reasons. In fundamental ways they represent the very opposite – and thus deadly enemy of – the democratic, progressive, anti-racist, much less, anti-fascist values their supporters claim they represent. One hundred years ago, across Europe the left was organising with the working class against the political establishment. Today, where it matters, the liberal left is just as likely to be shoulder to shoulder with the establishment against them. So we’re back to ‘either or’ again, but this time, with a twist.